1. Refusal of the agencies to answer queries raised by the Auditor General of the Federation. A reader of the current Premium Times report may be suspecting that the concern of the House Committee is about only how funds are being used in the RBDAs. The reader’s suspicion may not be unfounded but may miss a more profound reason. Our RBDAs have lost focus. This becomes glaring if one considers what they are currently engaged in (production of sachet water ‘pure water’ and bottled water) comparison with the articles of the edict that established them. • To undertake comprehensive development of both surface and groundwater resources for multipurpose use, with particular emphasis on the provision of irrigation infrastructure and the control of flood and erosion for watershed management. • To construct, operate and maintain reservoir dams, dykes, polders, wells, boreholes, irrigation and drainage systems and other works necessary for the achievement of the RBDAs functions and to hand over all lands to be cultivated under irrigation schemes to the farmers. • To construct, operate and maintain infrastructure services such as roads and bridges linking projects sites, provided that such services are included forming an integral part of the approved projects. • To develop and keep up to date comprehensive water resources master plan, identifying all water resources requirements in the RBDAs area of operation through adequate collection and collation of water resources, water use, socio-economic and environmental data of the river basin. DEPO ADENLE ============================================================ Nigerian lawmakers to probe water resources ministry, agencies Premium Times, July 17, 2013 The lawmakers will also probe the River Basin Development Authorities. The House of Representatives Committee on Public Accounts said it would probe the Federal Ministry of Water Resources and the River Basin Development Authorities over alleged misuse of public funds. The Chairman of the committee, Solomon Adeola, announced this in Abuja on Wednesday at a meeting with the officials of the ministry of and managing directors of the river basins. He said the ministry and its agencies had refused to appear before the committee to answer queries raised against them by the Office of the Auditor General of the Federation. Mr. Adeola expressed displeasure over the manner the basin authorities were administered over the years. He said the probe, which would be in form of a public hearing, would be transmitted live on television stations across the country. “It will give the managing directors the opportunity to speak to Nigerians on how funds allocated to them were administered’’, he said. Mr. Adeola explained that the action became necessary following the refusal of the agencies to honour several invitations of the committee. What I reported happened around 2001. I was at the Gombe office of one of the external donors. What happened was due to poor coordination between Federal and State Governments/external donors. The external donor was assisting the state in rural water supply and sanitation. The representative of the external donor was baffled about what happened and that was why he shared the information with me. If there had been proper coordination, what the FGN contractor did would have been avoided. However, I want to give you an example of the fraud that goes on in FGN projects. The picture I am offering here was taken around June 2011 at Bembe village between Gbongan and Orile Owu, Osun State. I saw a sight that was profound, albeit very strange: a woman was drawing water from a hand-dug well just outside the fence of a Federal Government of Nigeria (FGN) borehole! I asked the woman why she was not drawing water from the taps provided next to the fence of the borehole but she responded that it had never worked. What baffled me was that a huge overhead tank was provided along with the generator house which can be seen in the picture below. This water scheme must have been commissioned with a lot of fanfare and a silent rural community was deceived and then left without water. The villagers told me that the project was commissioned during Obasanjo era. 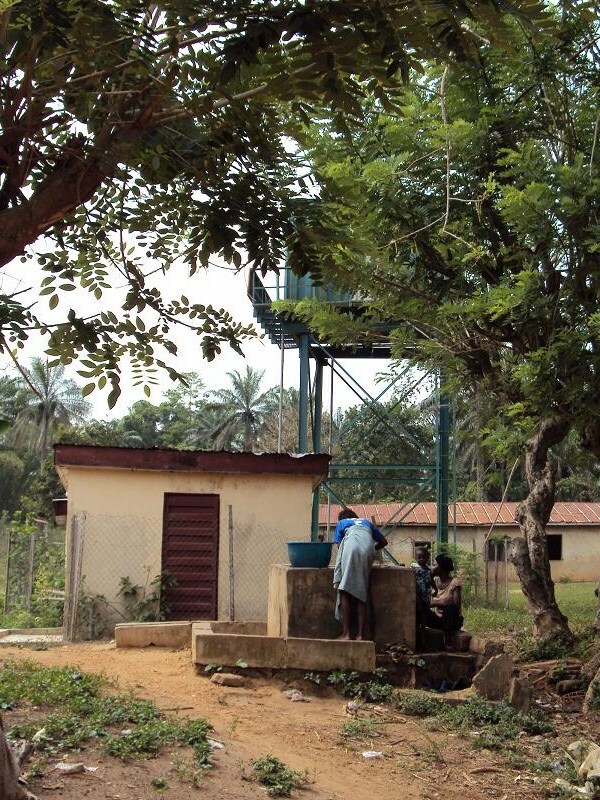 FGN Rural Borehole at Bembe village near Orile Owu, Osun State, Nigeria. Picture Credit: Depo Adenle, 6/2011. I heard that in some states on state water projects, civil servants collect N15,000.00 to look the other way instead of insisting on proper pumping tests for rural water supply boreholes. I do not know whether something similar had happened in the case of Bembe village. As it is in case of journalists, I cannot give the name of the State that stockpiled chlorine but that illustration is just to show the level of waste that has its root in corrupt practices. As for the ever- increasing population, it is not what will make the MDG goals shifting targets. The challenges posed by corruption are huge. Planning for projected growth in population is certainly a must for developing countries. Is it not true that we usually wait until any situation reaches crisis level before we act? When you set a goal you must plan to meet such goals. It is no use making laws that will not be enforced. There are plenty of statutes in our Penal Code to deal with thieving politicians but these are never applied. No politician in Nigeria has ever been recalled. Until Nigeria has its own Spring of Awakening: rallies of discontent as in the Middle East, we are not going anywhere with respect to fighting corruption. Thank you for sending this article to me and I must congratulate you for embarking on this project. We need to cooperate to fight corruption not only in the water resources sector, but also in the entire nation. The source of Luky Onyekakeyah’s article is not certain and I cannot freely comment as a result. Your experience in Gombe is however curious as one is not sure of the service supposed to be rendered by the Federal Government Contractor. It would seem that was what he was sent to do. Did he set out to rehabilitate them, but ended up messing them up by virtually shutting of the water source to the communities that relied on them? You definitely will have the name of the State that stockpiled 15 years supply of chlorine. Can we have the name of the state and the photograph of the chlorine canisters in the store? Publishing these items will serve to wake up the state concerned and others will sit up. The MDG was actually designed to be moving targets especially as it is based on reducing by half, the population of those without access to water supply and sanitation by the year 2015. Since the population is not static and continues to grow at roughly 3%, so will the target be shifting. Back to corruption. Majority of our political leaders are not committed to render service. They are simply interested in their personal welfare. While we should hunt and hound the corrupt ones, we should be vigilant during election times to elect credible representatives. By fencing off known corrupt politicians and those without serious commitment to service, we would have taken a bold step towards reducing the rate of corruption in this country. We should also without restraints, apply our rights to recall those that have failed us.